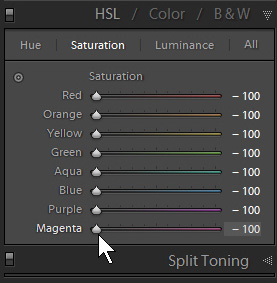 Back in the days of Lightroom 1.1, the B&W panel had a big defect – it disabled the Luminance noise slider – so Martin Evening and I (among others) recommended using the HSL panel. This meant setting all the colours’ Saturation values to -100% and then dragging the Luminance sliders, white balance, and other colour sliders. This method was only ever a workaround to avoid noise – Adobe soon fixed the problem and made the HSL workaround obsolete. Yet people still use it, even recommend it. Just because you’re using lots more sliders/panels doesn’t mean you’re actually doing something any better! It’s unhelpful in organising your work – Library records pictures treated with this HSL method as still being colour images, so you can’t use distinguish B&W from colour versions using either smart collections or the filter panel. Nowadays the HSL method’s value in B&W is when you want to leave 1-2 colours in a mostly-B&W image.